2018 is here! Holidays are finished, champagne is drunk, people are getting back to work. Let’s plan new year together to make the most of it! We selected a set of our best presentation diagrams collections, that will help you to plan the year ahead, create new strategies and report on sales results. 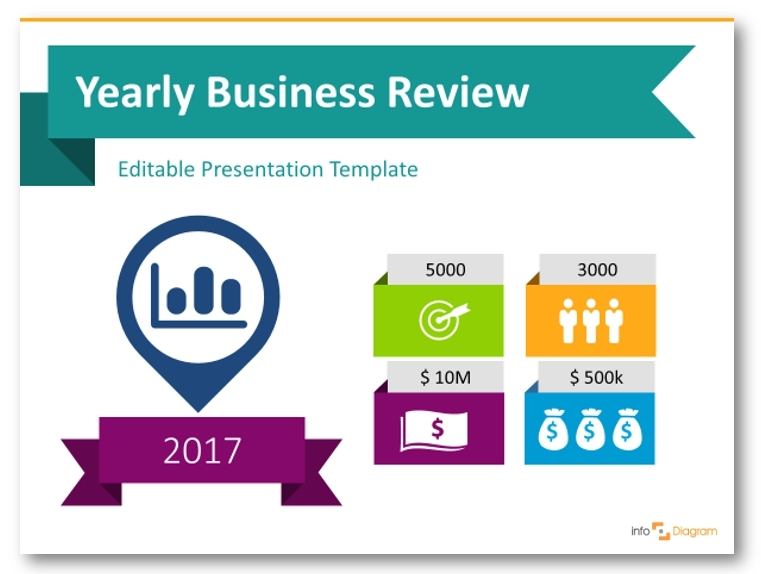 For this purpose, check Yearly Business Review PPT Template. 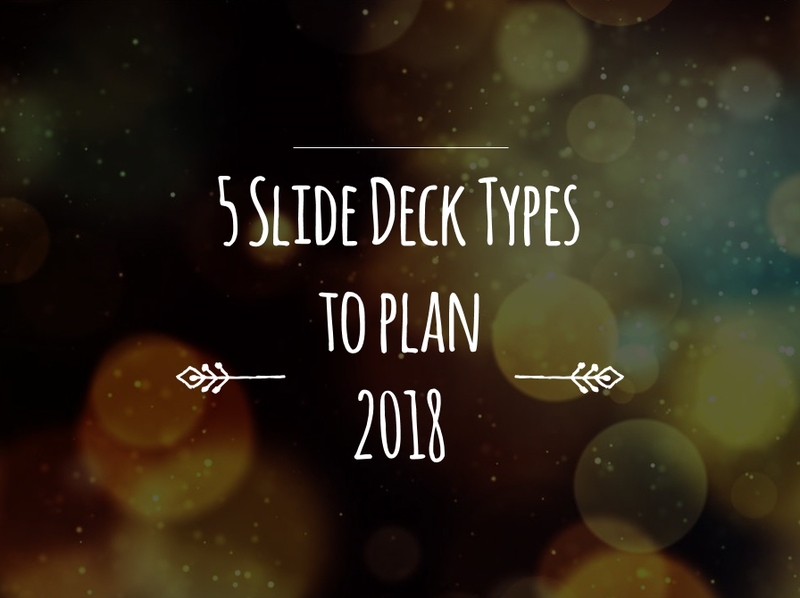 You can reuse these slides in your board reports, yearly round-up meetings or department review at the beginning of your company year. The template helps you to present the summary of the event calendar, show key financial data and performance indicators. There are also slides for showing visually your yearly goals achievement and further plans. Roadmap Diagrams for Project Strategy Planning can serve you well for holding a meeting where you discuss and set actions for next the months ahead. Having a clear and catchy visual presentation slides helps the audience to understand how your activities contribute to overall strategy, quarter by quarter. Your team will see you prepared thoroughly for such meeting and will be more likely to follow in the similar professional manner. If you want to add a sip of creativity and try a different look, we designed the business planning template also in a creative style – Handwritten PowerPoint Timelines. What comes next? You may need to perform a detailed evaluation of your yearly plans and objectives. Management and marketing offer several frameworks for doing such analysis. Choose a technique that you are familiar with and fits your business scale. You may need not only to plan a timeline but explain the pros and cons of each step. Or present features list of your solutions. For those, you can use a general diagrams slide deck, instead of using bullet points in your presentation. 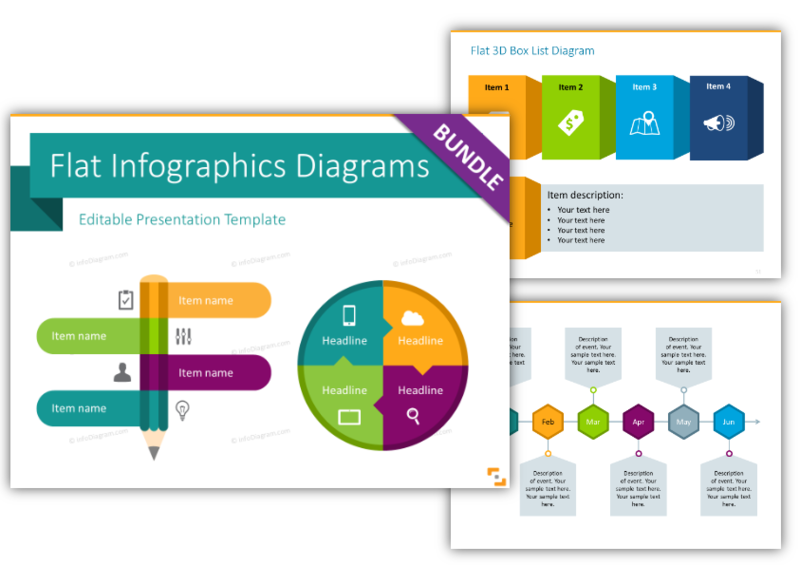 Check this Flat Infographics Diagrams for PowerPoint, where you’ll find ready-to-use graphics. 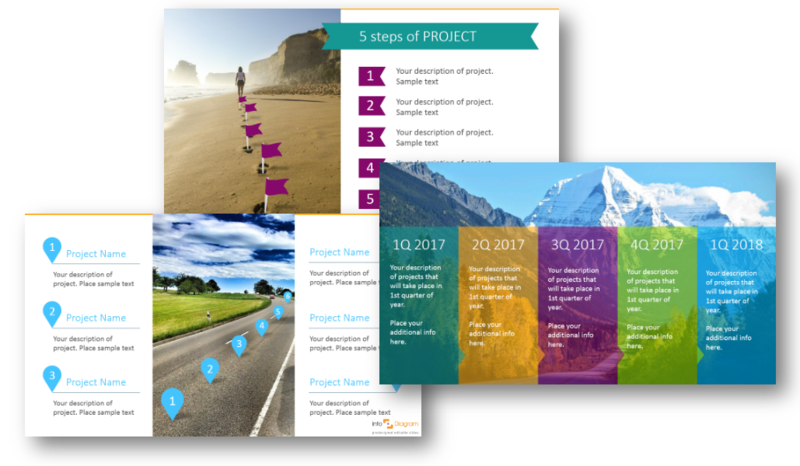 The template contains timelines and sequence diagrams, slides for the brainstorming process and results evaluation. There are also different variations of lists and steps to show progress or decline, sales funnels and KPI presentation tables. Furthermore, the deck contains 83 flat icon symbols that you can use to create your own infographics. You can have great vision and strategy (and we are sure you will) and perfect team. However, as a strategical thinker, you have to remember that there’s nothing worse than the wasted time of your team due to ineffective meetings and communication. Webinar Presentation of Problem-Solution that contains predesigned webinar content examples, editable graphics and slide layouts for preparing professional online meeting session. The template can be used also to prepare a webinar course. Whether you are working on long-term strategies or short-time development plans, communicating visually your message is important to align your peers working towards one goal. And that’s a prerequisite for success. We hope you will find something that helps you to plan properly next months. All infoDiagram team wishes you good luck and an incredibly productive year!